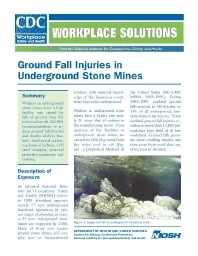 Workers in underground stone mines have a high fatality rate caused by falls of ground from the mine roof or rib. NIOSH recommendations to reduce ground fall injuries and deaths address baskets, mechanical scalers, mechanical bolters, drill steel changing, personal protective equipment, and training. Versión en Español de publicación N.º 2004-106.